some of our other books. An Island theme park, entirely devoted to torture! Great fun for the American tourists who came by galleon to this Island paradise, expecting to see suffering and getting it - not such great fun for the four friends whose yacht was sunk by the galleon and who ended up in the hands of the pirates! Were they spies, were they FBI? Their captors were determined to find out - using every method to do it! 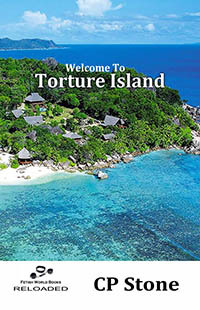 Is there any escape from the torture of Torture Island?